Newmarket Handicap winner Shamexpress returned home yesterday primed for his return appearance in the Group 1 Manikato Stakes at Moonee Valley on October 25. Trainer Danny O’Brien said he planned to give Shamexpress, which hasn’t raced since contesting the July Cup at Newmarket in July, a jump out at Flemington on Friday. 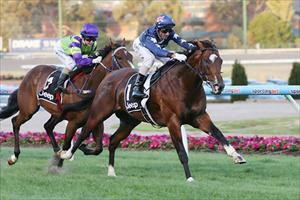 Shamexpress came out of quarantine yesterday and was floated back to O’Brien’s Flemington stables. “He’s brilliant, he’s in great shape,” enthused O’Brien. O’Brien will target the Manikato and Patinack Farm Classic, on the final day of the VRC spring carnival with Shamexpress.